Counter Bit Set, 4 pc. 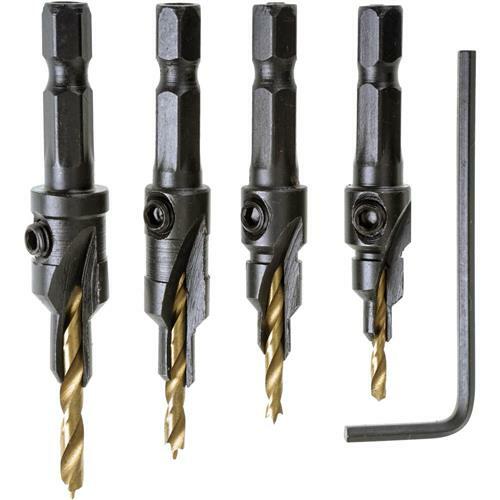 Milescraft 53410703 - Counter Bit Set, 4 pc. Specially designed steel counter sleeve countersinks or counterbores pilot hole simultaneously. Adjustable counter sleeve depth with allen wrench and standard 1/4" hex shank is quick change compatible. Four piece set includes bits for drilling pilot holes for screw sizes #6, #8, #10, and #12 and brad point pilot drill bits are tin coated (#6 bit is not brad point). Works fine produces correctly sized countersink for wood screws. 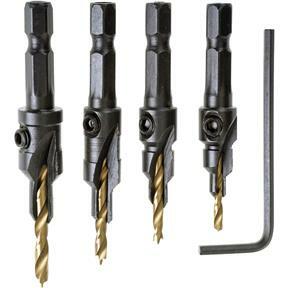 Adjustable drill length allows proper pilot depth for any screw. I have acquired some of these over time but recently moved and cannot find them. I'm fixing up a house and thought these might come in handy and as a bonus they were on sale for Christmas. Thanks Grizzly for offering such great deals.